Tuesday – Sunday 11 am – 5 pm. Free admission to Children’s Room. 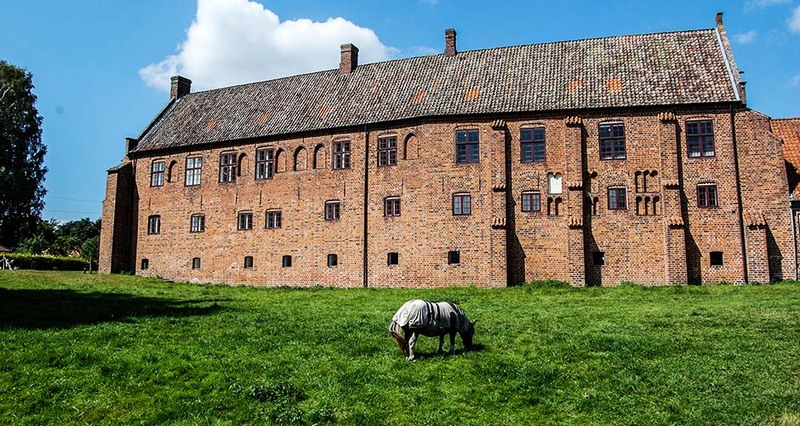 Exhibitions closed undtil fall 2019 due to renovation. Please take note of special/other prices for other activities. You can be at risk of being led to Klostergade in the town of Esrum you are are using your GPS. There is no parking here! The Millyard, on the other hand, has parking and you can get to it by Frederiksværksvej (route 205). There’s clear signage on the gravel road leading up to the parking spot. From Copenhagen through Elsinore: take the Coast Line to Elsinore and from there take the bus route 362 to Esrum. Get off at the old tavern in Esrum town. From Copenhagen through Hillerød: take the S-train to Hillerød, and from there the local line 940R towards Gilleleje. Get off at Mårum Station and take bus route 362 to Esrum. Get off at the old tavern in Esrum town. From Copenhagen through Elsinore/Hillerød: take the Coast Line to Elsinore or the S-train to Hillerød, and from there, follow the Santiago pilgrimage route to Esrum. You could possibly come from Elsinore, stay a night in Esrum, and go home through Hillerød. From Copenhagen through Hillerød: take the S-train to Hillerød, and from there the local line 940R towards Gilleleje. Get off at Mårum Station and walk the rest of the scenic 4.6 kilometres in natural beauty. You can also get off at Kragerup station and find your way through the forest of Gribskov. Go to Fredensborg (local line 930R) and walk to Esrum Lake. Here you will find canoe rentals and Fredensborg Boating. Both are ways to bring you and your company to the other side of Esrum Lake. Esrum Abbey is a 15 minute walk from there.